18th Century European influence. 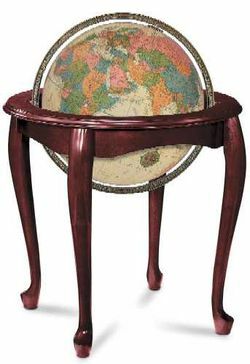 The stylish curved design of this solid hardwood stand with cherry-finish is complemented by a 16" diameter antique ocean globe with die-cast meridian. The simplicity, beauty, and quality craftsmanship of this chair-height floor globe will be treasured for years to come. The shorter stand makes this one of the lowest floor globes. Best for viewing while seated. Makes a great piece between 2 chairs and it illuminates!